We all know how it feels when you are on your way to your work or the airport, and you realize that your car battery is dead. The only thing you can do now is to find a stranger or call a friend that can jump-start your car. But, with these new portable battery jump starters, you never have to do that again. You can store one in your house or your car to quickly get access to it when you need it. These Jump starters are small with a lot of power, actually insane! With a portable jump starter at home or stored inside your car you don’t have to call a friend or ask a stranger to help you start your car anymore. With over ten years in the branch, I have tested most of the portable battery jump starters, and I wrote down the best jump starters in the list down below. I can approve that all of these jump starters are good for home-usage and even professional usage. First, you will find a list of the rankings of our jump starters. Down below you will find the reviews, and in the bottom, you will find some information. If you want to learn a bit more about Jump starters before purchasing one, check out our FAQ and Buyer’s Guide section in the bottom of the article. Scroll down or click here. 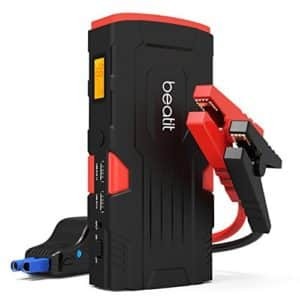 The Beatit 800A is on the top of our list of the best car battery jump starters to buy. With the massive 800A capacity, you can start diesel engines up to 5.5 L and petrol engines up to 7.0 liters. It’s a very popular jump starter and one of Amazon’s best selling jump starters also. Regarding battery backup and power bank, the Beatit 800A is considered to be the most fantastic jump starter out there in the market. The charging capabilities of the Beatit 800A is also a lot faster in comparison to the other options available in the market. Another great feature of the Beatit 800A 18000mAh jump starter is the alligator clamps that are attached to it. 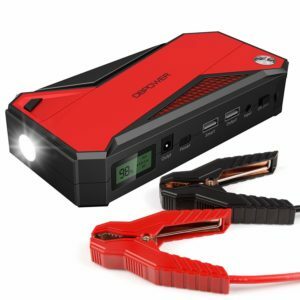 These provide a computer backed protection system within the jump starter that prevents overcharging and similar issues which can damage the battery of your car. This jump starter further houses a smart LED light which can be used as an emergency flashlight in case you need it. The compact design further allows you to place it in the glove compartment of your car. 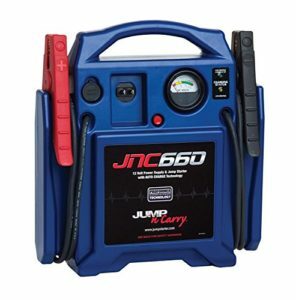 The jump starter has a smart computerized chip which can effectively assess and monitor the current. Temperature range between 60 degrees to -25 degrees. This jump starter is compact, and you can store it in your glove box which is a perfect place to store your jump starter. The Beatit 800A uses two USB ports, which you can use to charge your phone or other devices if you need emergency charging. That’s why it’s perfect to store this in your glove box inside your car. The charging time of the jump starter is speedy, and you can fully charge it in 5 hours by using the included charge cable. Moreover, this jump starter can ignite an eight-cylinder engine vehicle which has a capacity of 4L diesel or 5.5L gasoline. It can be used for jump-starting a variety of vehicles, including bikes, cars, boats, and others.. for smaller engines, it can provide as many as twenty jumps starts due to its powerful lithium-ion battery. USB charging ports for electronic devices, and 12V vehicle charger and wall. Very Powerful regarding boosting capabilities. When fully charged it can boost your vehicle for up to 30 times. Fast rapid charging. Charging it overnight will get you going and save up on your precious time. It is very user-friendly and provides maximum protection and an enjoyable experience. Although the jump starter is capable of charging certain electronic devices, it is not equipped for charging some cameras and laptops. The smart charging port offers 5 volts and 2.1A DC output. However, it is not known whether or not it uses an electronic chip to monitor the current that is being drawn. The DBPower 600A is an excellent choice if you have a smaller engine/car. It is a high-quality jump starter, but it’s, missing some peak amperes to jump-start big engines. The manufacturer claims that it can jump-start up to 6.5 L Petrol engines and 5.7 L Diesel engines. So it’s possible, but I still recommend to get an 800A jump starter if you have a larger engine over 4 liters. It is also one of Amazon’s best selling jump starter. The overall finish of the jump starter is perfect, and you can choose to get the jump starter in two different colors, red or yellow. You get the outstanding three years warranty with this jump starter, and it’s telling us that this jump starter is of high quality. The powerful battery ensures that you can start your vehicle multiple times whenever the battery dies. It also gives you an option for charging your electronic devices such as your tablet or smartphones. Also, this jump starter uses two USB ports and an emergency flashlight with SOS blinking. You will even get an included compass with this onekeep Led screen which you can choose the USB output voltage between 12v, 16v and 19v. This one is one of the best Lithium Ion Jump starters on the market! Over-charging and wrong-polarity connections is not a problem with this jump starter either. It uses a smart protect-monitored system. This jumper starter gives a variety of charging ports to charge various devices including your laptop. There are two computerized USB output ports, each with an output of 2.4A. A colour choice is available in red and yellow. The leads of the jump cable are shorter. There is no connection cable given for the iPhones. 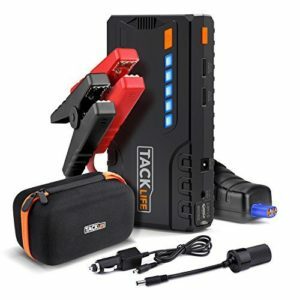 The Tacklife T8 800A is a small and efficient jump starter. This jump starters can start up to 5 L diesel engines and 6.2 L petrol engines. But if you have a bigger engine over 6L I recommend you to get a 1000A jump starter instead. It’s because all car engines are cranking with different resistance and you want your car to start when the dead-battery accident is coming. With the new update of this jump starter, you can now get a strong 12V/10A DC output female cigarette lighter adapter so you can run heavy-duty electrics like compressors, car vacuum cleaners etc directly from this device. Also in this jump starter, you will get two USB ports to charge phones and other devices. The jump starter comes with a nice soft-rubber surface and it smells quality. The manufacturer claims that it should be fire-resistant. 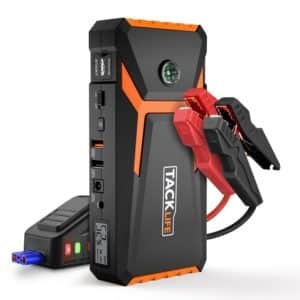 This jump starter is a really good starter for the price and I would highly recommend this if you are not having a large engine. Some reports of defective units on delivery, ours worked just fine thought. 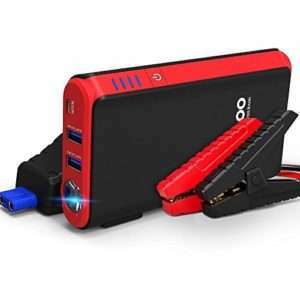 If you are looking for a small jump starter for an excellent price, the Gooloo Quick charger In&Out should be your choice. The jump starter is only rated at 450 Peak A when fully charged, so if you have any engine over 2 liters, you should consider getting a larger jump starter. The manufacturer is rating it to start petrol engines with 4.5 L and 2.5 Diesel engines. With the small size, it can be perfect to have it to start other vehicles like dirt bikes, ATV’s, etc. This starter is small, compact and an economical alternative to the other pricey stuff in the market. You will get 12 months warranty for this jump starter. It’s also equipped with USB ports for electronic devices. There are variations of output, which allows you to charge different USB electronic devices as well as the equipment of your vehicle. The product also houses state of the art safety technology system preinstalled in it to protect the user from accidents and damage. The small product entirely contains more than five essential safety features that ensure that your vehicle and you are protected. These include voltage protection, reverse polarity protection, overload protection, overcurrent protection and overcharging protection. A preinstalled feature of a bright LED flashlight is available within the product which can come in handy in case of an emergency and outdoor adventures. It contains three different types of LED light, including the SOS light, and strobe light. Finally, we have come to the jump starter at the last place on this list. But don’t judge the rank. 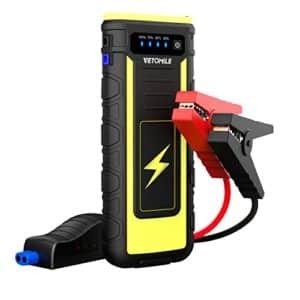 The Vetomile Jump starter is of a breathing quality at a low price and produces a massive 800A with this small size. You can start the most cars with this jump starter and the manufacturer spec it to 6.5 L petrol engines and 3.0 L diesel engines. This jump starter is entirely the best car battery jump starter for the money in my opinion. The charging time is around 6 hours for a full charge and with a full charge, you can start vehicles up to 30 times. The jump starter does not have all the fancy functions like other jump starters can have, but it does what it’s made for. To start the engines. You’ll get an inbuilt 3 mode flash-light and also here, two USB ports. A battery indicator will tell you when it’s time to charge your jump starter. If you are going to jump-start big car engines, a usual jump starter may not be enough. This jump starter will do the work, and it makes a massive 170A Peak. You can choose some different types of this jump starter. This jump starter is perfect for workshops that have to jump-start several cars a day. It comes with a 12V DC output to run air compressors or vacuum cleaners. This jumper works well with big Ford or Chevrolet engines over 6 liters with diesel. It’s equipped with a voltmeter to check the current voltage in the starter. The size of this jump starter is pretty big and heavy and it’s not necessary for the most types of vehicles. This should absolutely be your choice if you are looking for the strongest jump starter and are not afraid to have a larger jump starter pack. The size of your jump starter is something that you can be concerned about. Surprisingly the jump starts that are similar in function and efficiency may greatly vary in size. Usually, it is preferred to have a smaller sized jump starter for their compact design, lightweight, and portability. They are also easily adjusted in the glove box of your vehicle. Latest jump starters are equipped with brilliant multi-level safety and prevention technology which can prevent you as well as your vehicle from detrimental damage. These safety levels and prevention measures are enabled with the smart approach of the CPU in these jump starters, where it can detect whenever something is wrong. Even if you mistakenly connect the wrong cables, it will automatically set off an alarm. Different companies and manufacturers have different guarantees to offer for their jump starters. Whenever you buy a new jump starter, in almost all cases it will come with a warranty. However, the duration of the warranty and the terms and conditions may be different for each company. Therefore, it is essential that you carefully read the warranty terms before you purchase this one. You should also ensure that you will be easily able to replace it or get it fixed in case there is a need to claim the warranty. Reviewing a product before buying it is one of the most effective ways of making a smart decision for your purchase. When we say review, we don’t mean the paid reviews, but the reviews that are shared by the previous customers of that product. Through these reviews, the customers effectively share their experience with their previous purchases. However, you should be careful as to not fall into the trap of a biased judgment based on the review. You should expect to read both the negative as well as positive reviews for each product no matter how good a product is. Therefore, it is crucial for you to study both sides of the story before ending up with a wise decision. The price of the product you are interested in buying can vary greatly, especially when it comes to the jump starters. You can get a cost-effective deal if you are willing to compromise in terms of capacity, capabilities, and features. However, it is recommended to not compromise regarding quality when looking at an economical deal. You may be happy with a flashlight feature and other such accessories, but not with a bad quality product with the shorter warranty period. So, how do you use one of these tools? It’s really simple. Just locate your car battery which is often located under the hood of the car, but sometimes it can be found in the trunk or under a seat. However, most cars have “jump starter” connections under the hood which you can access easily to jump-start your car without reaching the car battery. Just connect the red (positive) cable from the jump starter to the positive cable on the car, often marked with a “+” sign and use the red color. The black wire (Ground) you should either connect to a clean part on the engine or the body. The best way is to connect this to the negative terminal on the car battery, but it can be hard to reach sometimes. So, a space clean from paint or other dirt should do the job for the negative terminal. Then you should read your manual of the jump starter. On some jump starter you can only start your car after the jump starter is connected, others you have to press a power button on the jump starter. Now if the jump starter is charging, and the actual problem is in the car’s battery, your car should start it immediately. What is the function and benefits of a jump starter? There are several benefits of using a jump starter instead of using the old technique of using jumper cables and jump start it from a car battery or another car. Here are the most noticeable benefits. The first and probably best benefits of using a jump starter instead of the old “jumper cable” way, is the size of the jump starter and the access of using it. In older days, when your car battery was dead, you did either had to find a car battery charger, and charge your car battery for a long time, or you had to find another car battery to replace it. You could also find help from another person with a car, but it’s time-consuming, and there are several dangers of doing this, which I will talk about soon. The size of the jump starters are often tiny, and you can store it in the glovebox and use it directly when you need it. For the most jump starters, you do only have to charge them each 1-3 months to keep the power great inside them. This helps us with all the problems a dead car battery that we discussed before. The biggest danger of personal injuries when it comes to car batteries, are explosions when you are trying to jump-start or doing other work to your vehicle. The car battery contains dangerous gas, which could make you blind fast if you get it in your eyes. If the car battery is leaking gas, and you create an ignition from spark when you are connecting the car battery, it may explode and cause serious injuries to you. Because of this, the most newer jump starters are spark proof which is a great function to have when you are connecting your car battery. Remember that it can, of course, cause a small spark anyways, but the chance is reduced a lot with a jump starter instead of jumper cables. A common problem when it comes to jumper cables is wrong polarity connection, which means that you are connecting the positive and negative terminal faulty. In most cases, if the car battery is draining when you are attaching them wrong, you can damage the most electronics in your car within seconds. This could be very expensive, due to the number of electronics in newer cars, and it’s most likely cheaper to buy a new car instead. Another great function, which is the overvoltage spike protection. Over-voltage spikes can damage electronics in your cars fast and you do not, really want to get an overvoltage spike because it can damage a lot of control units in your car directly. So, this is one of the excellent functions of a jump starter. Q: I have jumper cables, why do I need a jump starter? A: The problem with jumper cables, is that you have to find a person with a car that can help you. With a jump starter, you can store it in your glove box and reach it fast when you need it. Also with jumper cables, you can connect wrong-polarity and destroy a lot of electrical parts inside your car. All jump starters in this guide use protection for wrong-polarity and other protections. Only this can save you thousands of dollars and save you from bad situations. The best way to start your dead battery if you have the time is to use a car battery charger instead, but often you want to start your car as soon as possible. If you want a car battery charger instead, check out our article Best automotive battery chargers. Q: How often do I have to charge the jump starter? A: It depends on which jump starter you choose. Most manufacturers recommend to charge it every 30 days to be sure that you always have full power when you are needing it. I can recommend you the same, charge the jump starter it each month, and you will be sure that your car will start when you need it the most. Q: How long does it take to charge the jump starter? A: It depends on what jump starter you choose. A general rule is around 5 hours for a full charge, but if your jump starter only has to charge 50%, it’s fully loaded in a few hours. Q: How do I connect the jump starter to my car? Q: How many times can I start my car with one full charge? A: It depends on which jump starter you choose and how big your engine is. For a general answer, I would say around 10-15 starts is achievable with one full charge. Q: I have a medium 2.5 l petrol engine, which jump starter should I choose? Q: My engine light is ON after I jump started my car, what to do? Your engine light can often go ON after a jump start, and it’s mainly caused by the low battery voltage before. The best way to remove the engine light is to reset it with an OBD2 scanner. If you want to find the best OBD2 scanner tools, check out our article: Diagnostic scanners. It is not recommended to remove the battery cable to reset the light, as it may not always work and you will reset more functions by doing that. All the jump starters in this list are working well and that’s why we only listed five of them, to ensure that all jump starters in our list have a high quality. You do not have to spend thousands of dollars on a good jump starter, and you can often get a better one than you need for a low amount of money. Have you used any of these jump starters yourself and want to write a review for us? Comment down below! If you have any other automotive related questions, check out our other articles or send us a problem on our homepage.